LARISSA URBAN KTEL has been walking parallel to the city of Larissa for the last 50 years, contributing essentially to the development, progress and prosperity of this city. The first buses circulated in 1939 for a short time, they were 2 in number equipped with 19 seats. The war soon ended their circulation and they reappeared at the end of 1948 and beginning of 1949 by individual owners who, by virtue of a police permit, were executing itineraries with 14 buses of 32 seats by choosing the lines that were considered to be more efficient. In 1952, under the Law 2119, the KTEL Companies were founded and the first effort to organize the passenger transportation was made, which was completed by the Legislative Decree 102/1973 and recently by the Law 2963/01. Since 1972 the fleet of LARISSA URBAN KTEL numbered 28 buses. In 1980, the replacement of all buses with new and bigger ones, of B-100 type, started. During the last years the Administration of LARISSA URBAN KTEL is making an impressive attempt to reconstruct and update, which was supported by all shareholders, who continuously invest great capitals in order to achieve the goals set. but mainly due to the increase in the bus fleet, from 28 to 48 buses of all types - i.e. MINI BUS - regular, articulated – we gained the trust of passengers of the city, who enjoy high-quality services. In 2002 we were pioneers in another field and by founding a Tourism Office we bought a touristic train, which gives a touch of freshness to our city, offering unique moments to young and old friends of our city. It is an outstanding opportunity for everyone to meet the beauties and sights of our city.After all these achievements, LARISSA URBAN KTEL was widely recognized and accepted by the city of Larissa, enjoying the respect and the excellent collaboration with the local authorities of the City and the Prefecture. In 2004 LARISSA URBAN KTEL S.A., keeping its promises to passengers and being socially responsible, proceeded to the full fleet renovation by introducing new buses of latest model with air-conditioning and low floor, fitted with entrance ramp designed to be used by people with disabilities (AMEA), sparing no pain, time and expense and raising the bar higher for the benefit of passengers of our city. 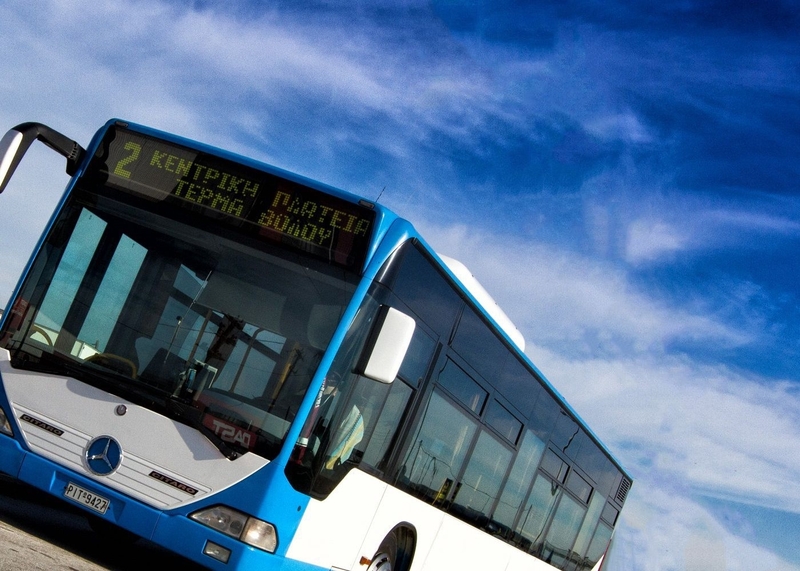 It is worth mentioning that LARISSA URBAN KTEL S.A. is equipped with 28 of the most modern buses of Europe. LARISSA URBAN KTEL, being pioneers for once again, the unique body in Greece, with a feeling of national pride and task, satisfied the desire of residents of Larissa by participating in the Olympic Games. Its fleet was chosen as the most modern, appropriate and safe one for the transportation of the Olympic Family to the Athens 2004 Olympic and Paralympic Games. It should be highlighted that all heads of Athens 2004 and many foreign journalists and television channels worldwide unanimously acknowledged that LARISSA URBAN KTEL was worthy of the gold medal for the transportation of the Olympic Family, receiving best comments about the fleet and bus drivers. LARISSA URBAN KTEL continuing the effort to update the business by making use of new technologies, aiming always at the more qualitative and efficient passenger service, is under the process of a project completion with title “Integrated Telematics System for Passenger Dynamic Information and City Bus Automatic Ticket Issuance of LARISSA URBAN KTEL S.A.” The project includes the implementation of a fleet tracking system of URBAN KTEL with the possibility of passenger information through Telematics Intelligent Stops about the expected time of arrival of buses as well as a website with the possibility of travel planning by using means of urban transportation and a SMS service that offers bus arrival time estimation are also available.